So we set out early (9:30 is surely early by any standards 🙂 ) It was a bright sunny morning.. just the perfect start to an exciting day.. Well if we were excited with what we had seen on the first day, we were to know that it was nothing as compared to what lay ahead for us. Solang was about 1-hour drive from Manali. The scenery on the way was literally a treat for the eyes. The temperature was falling we were heading close to the snow covered areas, but we were least bothered about it. We reached Solang at about 11. Finally we found snow!! Seeing snow from so close for the first time was driving us crazy. Hurriedly we got a pair of snow-shoes each and rushed towards the main area. And wow!!! The view inside was really mesmerizing. I was simply awe-struck by sheer beauty of the scene.. It was just snow, snow every where…. A large plain mostly snow covered area.. adjacent to some heavily snow-covered mountains… And everyone present there was enjoying the moment to the max.. Some were skiing, some were having a snow-scooter ride, others were tracking on the snow-covered hills and some others were just enjoying the beauty of the nature.. We decided to follow the group3 and go for some tracking..
We started moving up on the snow-covered rocks.. Though it was a bit slippery, but it wasn’t that hard as the thickness of snow was at least 5-6 inch, enough for the shoes fit in tightly. Now we were literally inside snow.. We were enjoying this all: Playing with snow, making snowballs and hurling them at each other.. The only thing missing was snow-fall.. We did try to create some artificial snowfall by picking up snowballs, throwing them high and breaking them in mid-air. At least, that could work well for the snaps, but it didn’t come that gudd ..
With paragliding done and having had our lunch, we were left with little money. 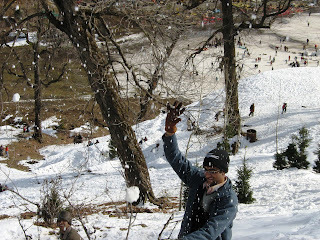 With about 150 rupees in my pocket, I was the richest in the group at that time :D. So we had to give skiing a skip. But just for the records, we had managed a snap holding the ski-sticks with the local-ski waalas. 🙂 And yes.. the bargaining here knows no limits. The ski-waalas were ready to let us enjoy skiing for Rs 300 for 4 persons; while another group from STM (Anuj’s friends) paid as much as 500 per person!!! Finally it was time to bid a goodbye to this paradise of snow. We did enjoy a yak-ride before we left. As we were to know later, the Solang world was surely the best part of our HP trip. Next we decided to move to Kothi: the next thing on our itinerary. But we were in for a disappointment. The driver stopped at a point called Café Kothi saying that this is the place. Now the place looked marvelous if considered a restaurant to be stopped at on the way. But that surely wasn’t a place which a person would come to see specifically from Manali. We asked the local janta and got to know that though the place was really Kothi, the thing which people come to see is a snow-point 2-3 kms higher. But the driver was adamant not to take us any higher without charging more money. We called up the Taxi Union President in Manali. He appeared to understand the situation, but he said that he can’t do anything in this case because though the driver was on the roll of the Union, the booking wasn’t done through the union. If later was the case, he’d have instructed him to take us to the desired point. So anyone reading this and planning to go to Manali, make it a point to book through some authorized body only. After arguing for some time, we decided not to spoil an enjoyable day with some stupid driver.. In any case we had seen enough of snow. So we decided to head back to Manali. We were too tired now to do any marketing, though had planned earlier at least to buy some Kullu-shawls for mom. We rested for a while and had our dinner. Before long, it was time to pack up and move to bus-stand for an overnight journey to Shimla. We had a real great time at Manali. Considering that we were not able to go to many places ( Gulaba, Manikaran, Rohtang etc are some names I remember), perhaps two days are not normally enough to cover this beautiful place fully. I would surely like to come back to the place with more time at my disposal if given a chance. Nice post! Was a pleasure to read and remember that “I was there too!!”. I feel u shud not have skipped skiing, given that I warned u earlier that TAKE EXTRA CASH!!!! That Kaushik video is hilarious.. Aakash’s sarcastic voice and your afraid tone makes it truly amusing 🙂 .. i hope somebody had recorded the glider falling on ya :D!! The Second and the last pic are particularly attractive and truly characterize Himachal as the best tourist destination in whole of India!! randomly googled ur blog..i must say looks a really nice place..which month had u`ll gone ?? i am planning a trip in jan ..
again for sharing this post! !